After trying loads of different brands, bottles and tests baby lovea MAM. Self sterilizing, no leaks, anti colic, nice comftorble design. I love love love mam bottles! The self sterilising design makes this bottle so easy to steralise in the house or out and about, simply wash, fill with the correct amount of water and pop in the microwave. The design is colourful and pretty offering different colours to suit your preference. The shape is comfortable to handle and a lovely overall design. My baby got on great with the bottles never any issue with feeding. Didn't completely get rid of colic but defiantly helped and made things easier. I love this product, I had to do mixed feeding with my new born and had bought the Tommie Tippie bottles, what a nightmare they were constantly blocking slow feeding severe colic and struggling to get my poor little ones wind up. But since using the mam bottles i have never looked back my little lady loves the teat, is much easier to wind her feeding time has become a pleasant and relaxing bonding experience instead of the month of screaming and crying I had to endure previously. Would highly recommend this product. This bottle is easy to use and is very easy to clean and sterilise. I have found it very useful to be able to sterilise it in the microwave whilst visiting friends or family, and not needing to take my steam steriliser! I like that I can take it completely apart for hygiene purposes, and also that it reduces the air that my baby swallows. Durable, anti-colic, easy to clean, sterilises on the go, lovely designs. These bottles have been perfect use to us, my lottle boy was born with severe to gue tie but he was able to take really well to these bottles and adapted to them well after the tongue tie was resolved, the specialist told me that these were by far the best bottles to be using. We love the designs and they are very durable for use. They are handy when out as they can self sterilise in a microwave which we have had to do on a few occassions. I would highly recommend these bottles to anyone. We tried these when my son was 2 months old due to him struggling with his milk and absolutely love them. I hadn’t really heard much about them but would have tried any bottle with the promise it will help my son out. These look super cute and actually helped him cope with drinking! I love how they self sterilise aswell as coming apart really well to put in an electric steriliser. Mam was the only brand my baby accept and I’ve different other brands and mam is the only that is to wash and easy to sterilised. We have recently brought a few of these bottles to try something different however my son does not like the teat shape. The bottles are very easy to sterilise especially when out and about. I first bought Tommee Tippee bottles to try with my baby. 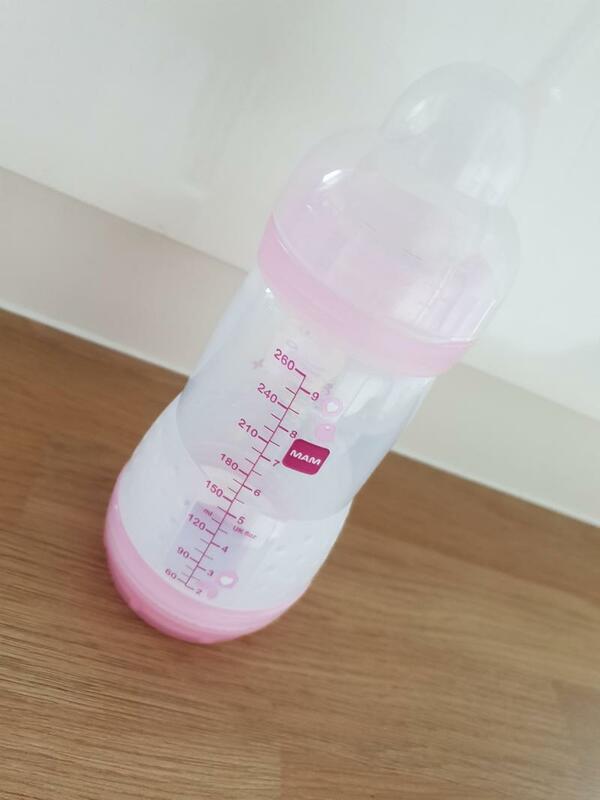 As I’m currently exclusively breastfeeding, I wanted to start to introduce a bottle to my little one, as she wouldn’t take to the Tommee Tippee bottles I had already got I decided to try the Mam bottles. I bought mine from Boots and at the time there was an offer on (this is the only reason I bought them). Because I didn’t want to spend much money just incase my little one wouldn’t take to it again, I got them on offer. I don’t feel that at there original price there are worth it. Although one thing I did really like was the fact you can sterilise the bottle without needing a steriliser. Great for it your out and about. One thing that drawn me to this product was that 94% of babies the product was tested on would take to this however my little one did not. Overall I would recommend this product but only if they are on offer. So my son had horrific colic when he was younger. 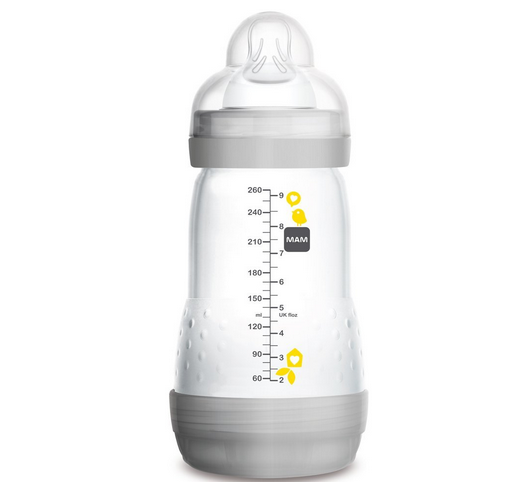 I was using tommee Tippee bottles after doing some research and asking various midwives I found a lot of people find them using the same bottles and having colic. I then asked what bottles to change to, I got recommended these and ever since I started using them and the colic went within 3 days. They are amazing. The sterilising feature is so much easier to use you can sterilise on the go and they look great the colour range with little pictures are so effective. I couldn’t recommend a better product! My 12 week old baby is breastfed, although at the beginning he was combi-fed, and used tommee tippee, however for about 9 weeks we exclusively breastfed, however we needed to leave him with grandparents for a few hours, and we discovered he’d gone off the original bottles, so we’d heard these we great for breastfed babies so just purchased one, they are incredible and he took to it instantly! These bottles were a life saver. After being up every hour with a baby with severe colic, after trying several different bottles and milk formulas and medications nothing working at all . We heard that mam bottles were the best with colic and we have never looked back. Even now at 10 months our daughter refuses any other bottle. These bottles are like gold. They are so worth the money and stopped the colic completely. I will recommend these to everybody they are so worth the money and the best bottles going. After 4 months of trying different bottles we’ve finally found a good bottle that baby likes. Easy to sterilise and clean. These bottles are great. As listed above, my daughter takes this bottle perfectly when drinking expressed milk. She switches from breast to this bottle fine, and always has done. My second favourite thing about these bottles is being able to self sterilise them in the microwave for 3 minutes. This is amazing and can be so handy when out and about. I found this excellent when we went on holiday because I didn’t need to lug a huge steriliser pot around. These bottles have also prevented my baby from getting any colic and she comfortably feeds from them with no tummy or air issues before or after feeds. They come in lots of lovely little designs and can be swapped and changed lids etc when you have a little collection at home. I would say the only couple of down sides would be that they are a tad pricey. Though I would say they’re worth it. Also, sometimes the rubber insert in the bottom of the bottle can require more cleaning than usual. I love these bottles!! My first daughter had a milk allergy and bad reflux, and I went through literally every single bottle on the market to try and help her. MAM anti colic were the only bottles that reduced her reflux and eliminated the painful trapped wind. They are self sterilising, and you can do more than 1 in the microwave which is a life saver! The only pet hate I have is that because there are so many parts to take apart and clean, and then put back together, it takes absolutely ages to hand wash, rinse, put back together etc. So my little boy suffered with reflux and we tried all different bottles. We found that the mam anti colic ones worked a treat as they helped to get his wind up which meant he was less sicky. The design is super cute and it’s gender neutral! The fact you can sterilise them in a microwave is amazing because it’s hassle free! The only down side is that the number have came off my bottles, but only the grey ones. We have blue ones and they’re still perfect! These bottles are something I will ALWAYS recommend to expecting mamas that I know are wanting to bottlefeed their baby, whether that be with breast milk or formula! These bottles unscrew into 5 pieces so that you can sterilise them in a microwave without the need for a steriliser - genius! This feature makes them highly practical because they can be sterilised wherever you have access to a microwave and some soapy water. They are long lasting and have a chain of teats you can purchase to take you from newborn to 6+months. For any future children I have these bottles will always be my go to. 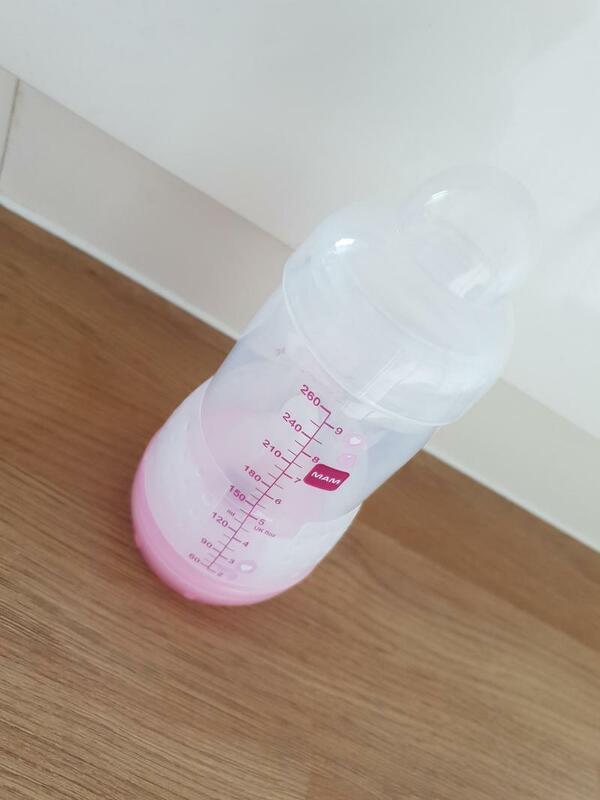 Only bottles my breastfed baby would take and continues to take they are clearly marked and have a nice design aswell only downside is they can leak if not secured well enough they are easy to clean as they come apart in sections which I preferred to previous bottles. Design and best bottle for a breastfed baby! This is a great bottle. It’s perfect to travel with. My son didn’t like drinking from this so we didn’t use them long but for a less fussy baby I’d highly recommend them. We loved these bottles. Not having to use a sterilizer was a life changer and they are fantastic for trips away because on that. We did once have issue with a tiny microwave though as they are tall. 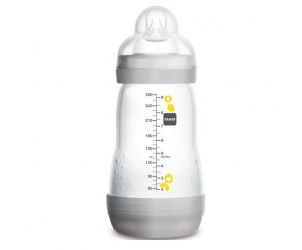 The MAM Easy Start Anti-Colic bottle is ideal for newborns: babies can drink at their own pace. The bottle features a SkinSoftTM silicone Mam teat which is accepted by 94% of babies. The MAM vented base limits colic and regurgitation for relaxed and comfortable feedings. It has wide openings for easy filling and cleaning and a unique self-sterilising function, ideal for outings.